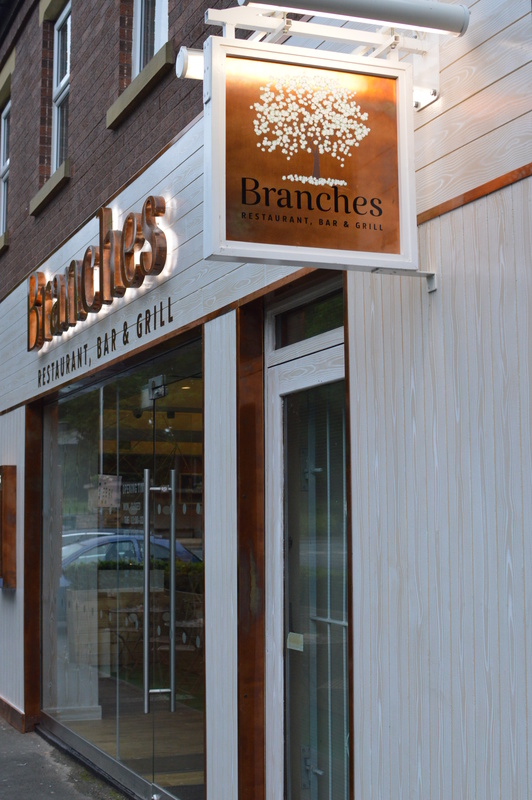 Branches Restaurant opened in Ponteland at the beginning of April, I spotted it on a random trip to Waitrose mid-April. The restaurant is on Brewery Lane, right next to the entrance to the Waitrose car park where Indian restaurant Sampan (RIP) used to be. 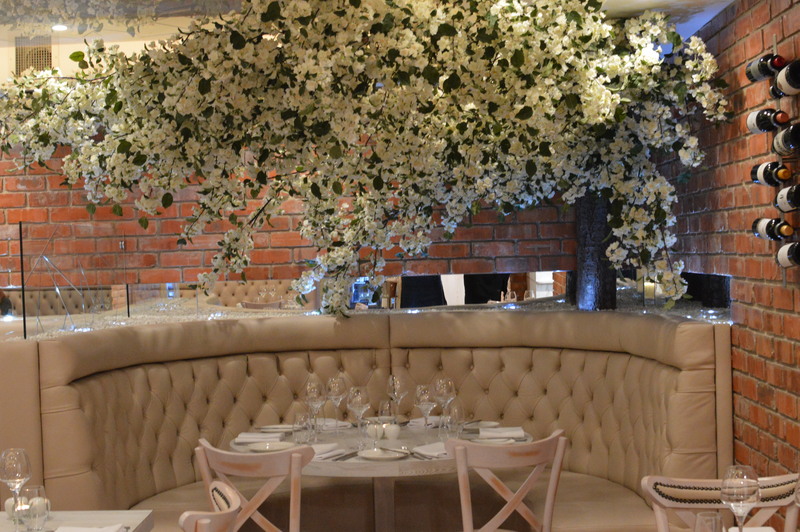 This new venture is owned by businesswoman Aysha Pervez, with Chris Finnigan as Head Chef (whose name you’ll recognise from Lane 7). Chris trained for 4 years under Raymond Blanc and I was really looking forward to sampling the food which promised to be ‘modern British food with French influences’. The restaurant is pretty impressive the moment you walk through the doors. 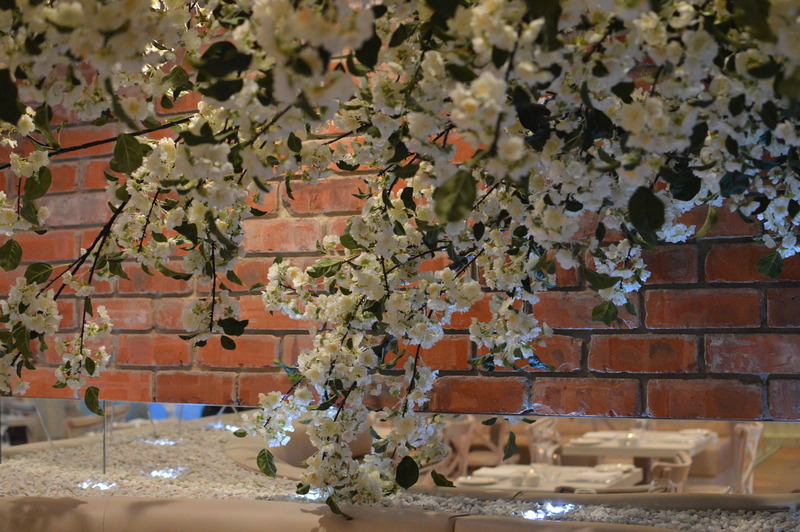 Bright with creamy coloured furniture and exposed brickwork… you can’t help but be drawn to the pretty blossom tree in the corner of the room. We were seated right next to the window, natural light is the best for photos (really not a fan of using the flash!). We were handed menus, read the specials (the board was too far away for me to read – even with glasses) and ordered drinks. 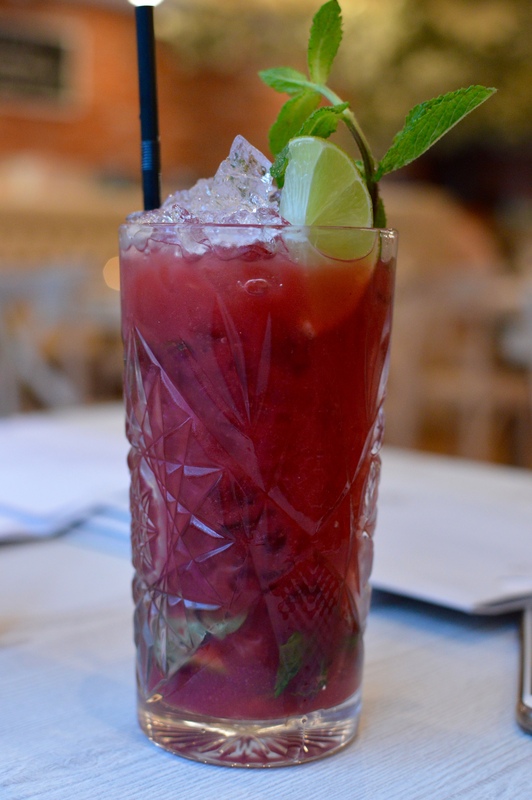 Emma ordered a Raspberry Mojito rather than a regular one and I got a sparkling water with blackcurrant cordial. 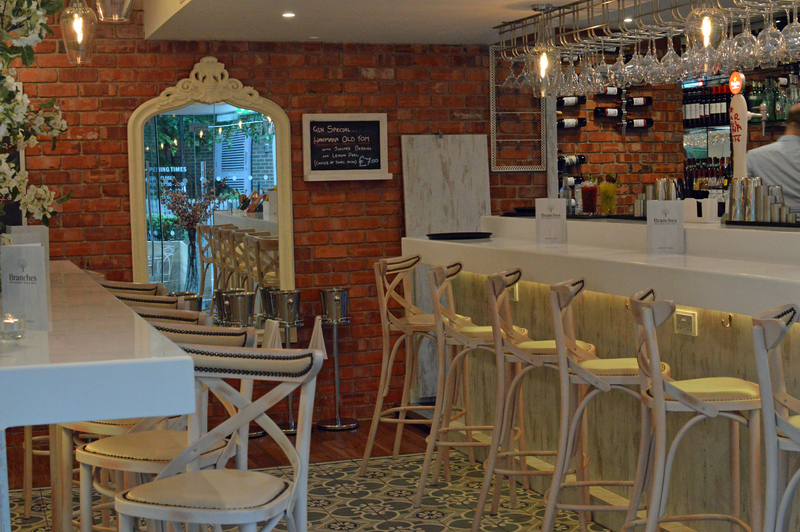 In terms of menus, Branches have their full All Day Menu (which we ordered from) but they also have their ‘Market Menu’ which is available from 12pm-10pm Tuesday-Thursday and from 12pm-5pm Friday-Saturday. 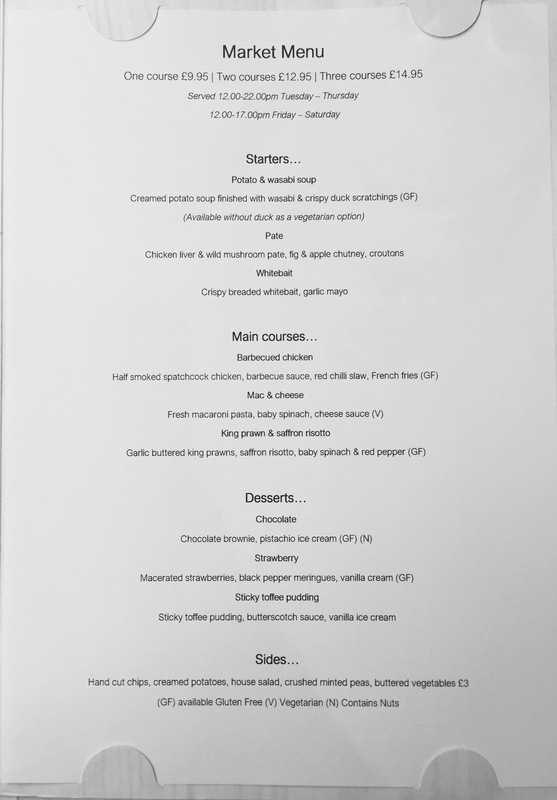 The Market Menu is £9.95 for one course, £12.95 for two courses and £14.95 for three courses. Thought I’d mis-read those prices the first time I looked, very reasonable. We ordered the focaccia with chicken butter and dipping gravy (£3.50) to share ahead of our starters (thank you to our lovely waitress Helen for suggesting it). 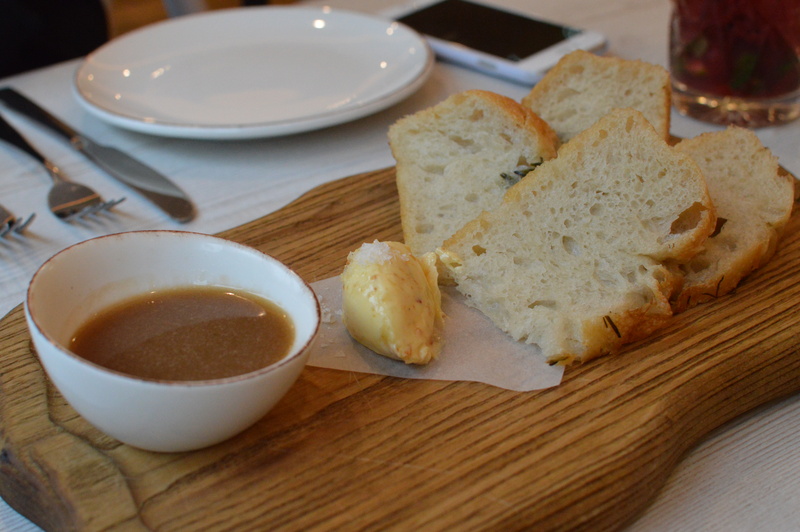 I cannot tell you how delicious it was – warm focaccia, with a thick layer of chicken butter, dipped in gravy. There’s no pretty way of eating this, but it’s well worth it. It was comfort in a bite. Why has it taken me 36 years to taste chicken butter? Better late than never. 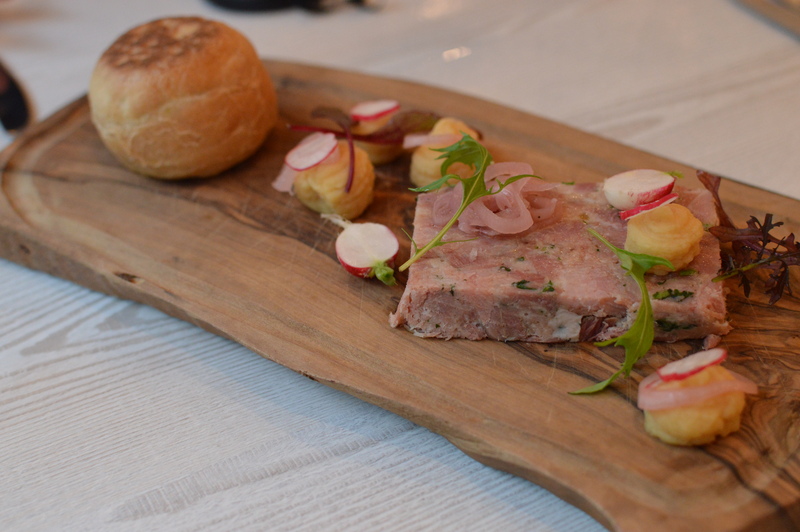 For starters, Emma chose the Scallops (pan fried scallops, black pudding bhaji, cauliflower puree, curry oil, £9.50) and I went for the Ham and Pease Pudding (terrine of ham hock, pease pudding, pickled shallots, warm stottie bread, £6.50). Both were beautifully presented and even though I offered Emma a taste of mine, I was happy when she declined! 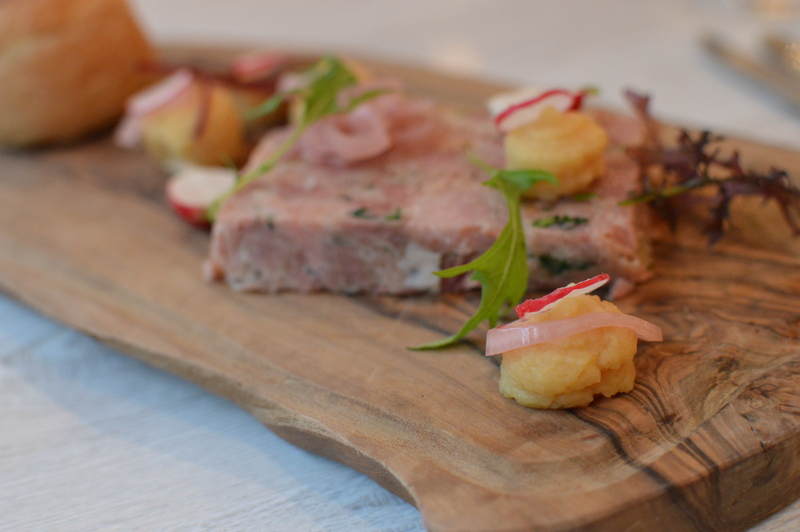 Look at those little dollops of pease pudding and the delicately placed slices of radish. The terrine was perfect, the stottie was warm and there was just the right amount of pease pudding to spread on the stottie. 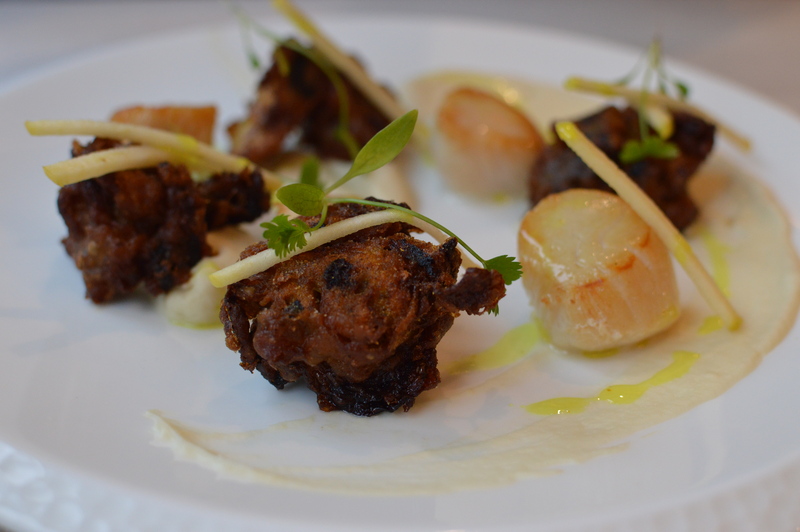 Emma loved the scallops, they were cooked to perfection and were accompanied very well by the curry oil, cauliflower puree and black pudding bhaji. 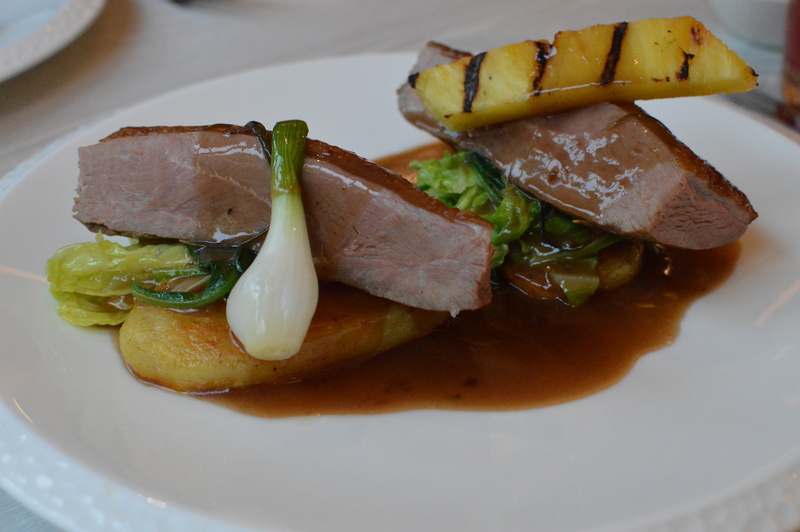 For our mains, we both opted for the duck (slow roast breast of duck, confit potato, savoy cabbage, charred pineapple, sherry vinegar sauce, £17). Definitely my kind of dish, loved the tangy pineapple with the duck, and the skin was crisped perfectly. Chris sent out some duck salt for us to taste too, which was gorgeous, especially sprinkled on the confit potato and cabbage. It was so aromatic – hopefully this will make its way onto future menus in some way! It was around now we got another round of drinks. 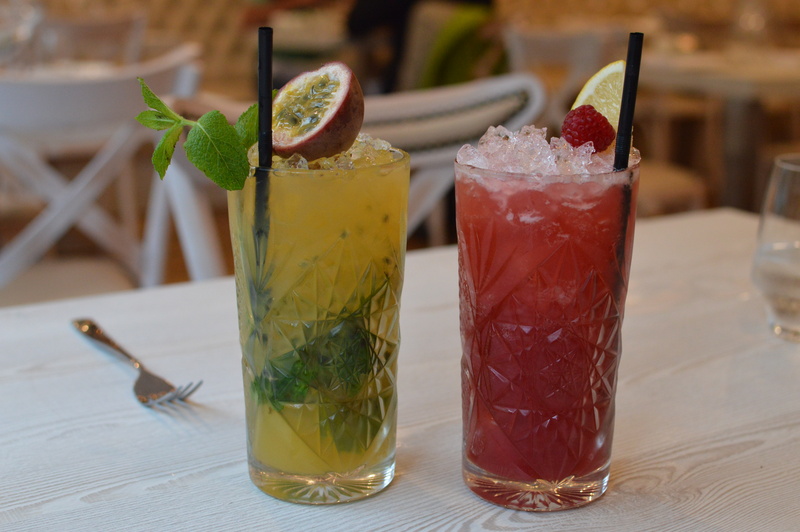 Emma got the Passionfruit Crush and I had the Berry Haze (non-alcoholic). DELICIOUS. We’d been there for almost two hours by this point, time was just flying by. The atmosphere is relaxed even though it’s fancy, it’s not stuffy or scary in the slightest. The staff were really welcoming, friendly and helpful. I often need help making final menu choices, I’m forever indecisive. Martin managed to convince me to pick the Petit Fours for dessert, from the specials board (vs. the Chocolate Garden I’d had my eye on). Emma got the Chocolate Garden. We ended up sharing both desserts… Ideal situation. Martin (who I’d nicknamed ‘the boss of drinks’) told us about a dessert cocktail that was going to be on the new menu, it’s called the Branches Chocolate Blossom, made up with white chocolate, hazelnut and liquor. He said it tasted a bit like a Kinder Surprise and made us one to taste, I had a few sips. It was so moreish! Loved the flavour combinations in this cocktail. Look out for it on the new menu! 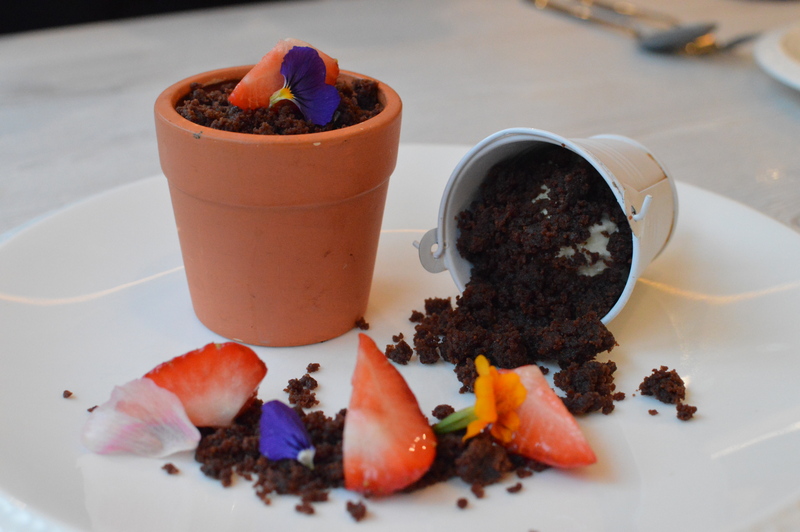 The Chocolate Garden (hot chocolate fondant, macerated strawberries, chocolate soil, mint ice cream, £5.50) was plated beautifully, served in little plant pots. 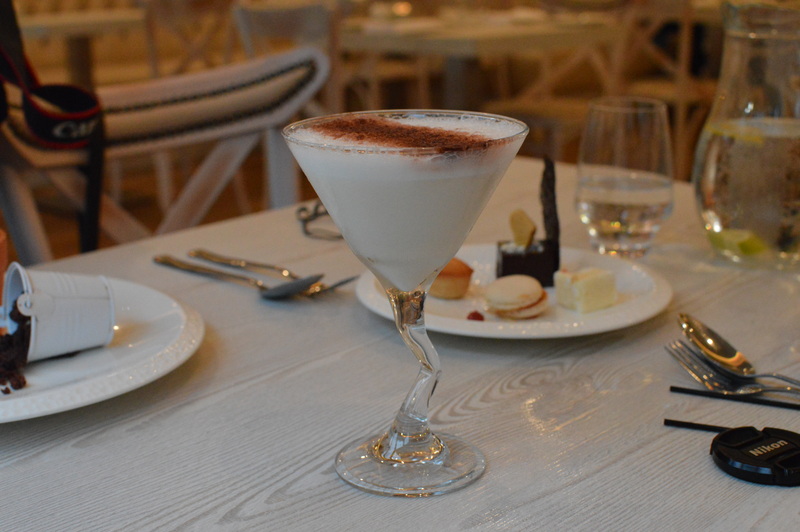 Can you describe a dessert as stunning? It really was stunning, the photo doesn’t do it justice. The Petit Fours (mini desserts) were: white chocolate & salted caramel macaroon, coconut financier, passionfruit marshmallow and chocolate brownie, £5). Both desserts were fantastic, the Petit Fours were so different to each other in terms of both taste and texture, my favourite was the passionfruit marshmallow. 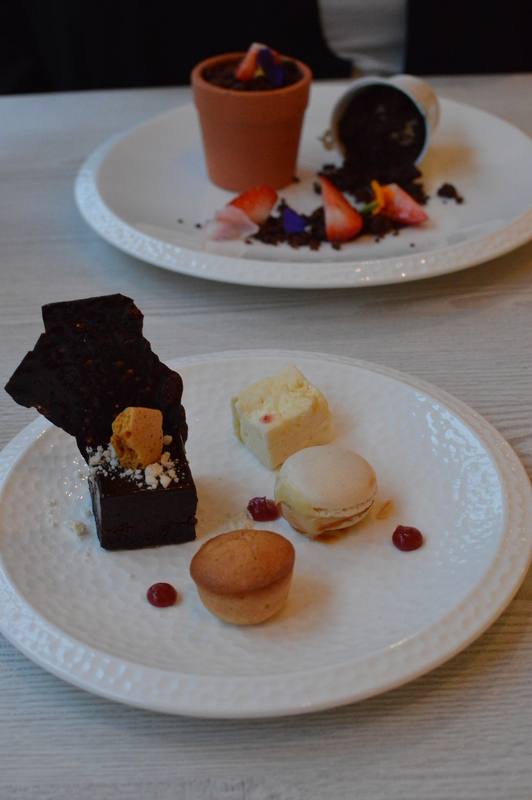 The Chocolate Garden totally exceeded my expectations, I knew it was going to be good but it was beyond delicious. The combination of the hot chocolate fondant with the mint ice cream – yum. I’m getting this next time I go, 100%. Before leaving, we chatted to Head Chef Chris (and Sous Chef Danielle, briefly!). It was great to see how passionate Chris was about the menu, creating all of these wonderful tasting dishes and using the best quality ingredients. You can clearly see the mark Chris has made on the menu. There’s a real mix of dishes to choose from – while still being quite concise (which I am always a fan of) and from the sounds of it, they’ll be changing it up every couple of months. The new menu will be available in the next few weeks. 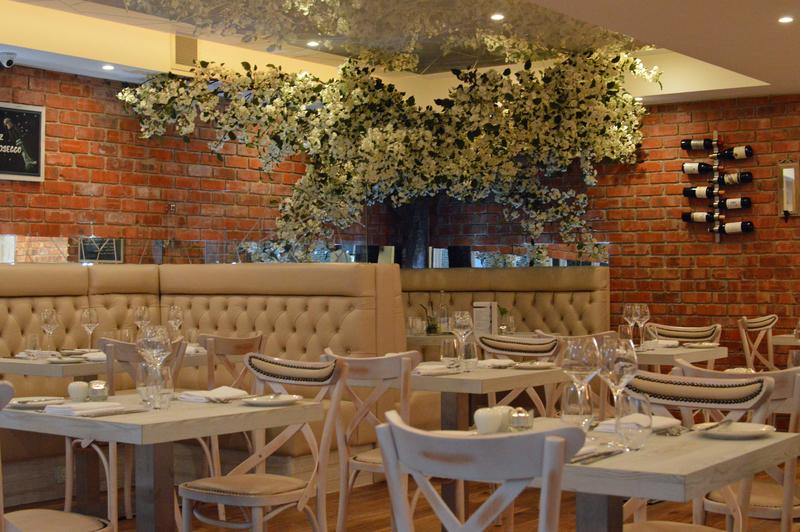 I absolutely loved Branches, it’s some of the best food I’ve eaten in Newcastle. I genuinely cannot fault the food or the service. The people of Ponteland are lucky to have it on their doorstep. It’s a very welcome addition to the village and only a 10 minute drive away from my front door. Yesssss! 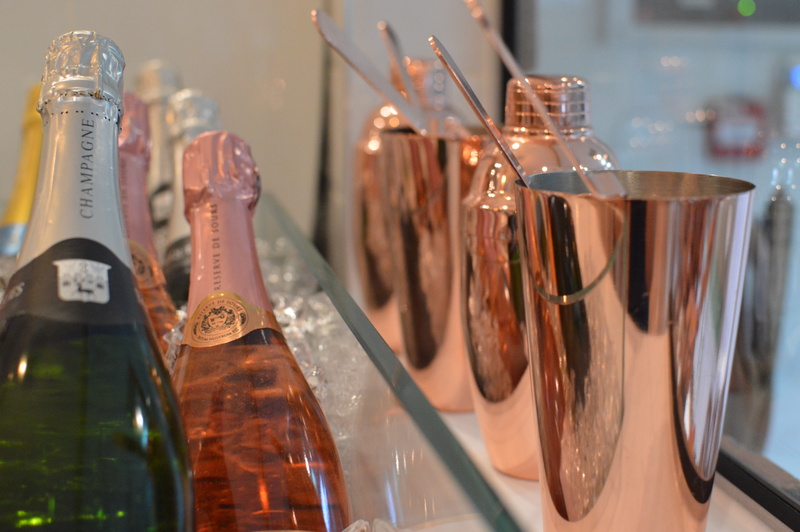 If you’ve already been or decide to pop in, do let me know what you think! I had to visit Branches (on your recommendation) and I loved it! Totally regret not getting the chocolate garden but I was too full after my main. I’ve promised myself I’ll get it next time! Dessert regret is the worst, you must go back! Glad you enjoyed it 🙂 Such a cute little restaurant and great service too!